Coach Laura Seward’s Tri-Valley varsity softball team traveled to Muskingum Valley League foe West Muskingum Monday night, April 8, and came home with a 17-6, five-inning win. The victory improved the Lady Dawgs conference record to 5-1, while hiking their overall mark to 10-2 on the 2019 season. Tri-Valley had the hot bats to start the contest, lighting up the West Muskingum scoreboard for eight first-inning runs, powered by senior Hannah Worthington’s three-run homer and a round-tripper as well from fellow senior Maddy Wortman. The Lady Dawgs tacked on another run in the second inning, then put the game away with a five-run fourth inning, and three-run fifth inning, for a 17-1 lead. The host Lady Tornadoes came close to extending the contest, but came up one run short, scoring five runs in the bottom of the fifth inning for the final 17-6 tally. 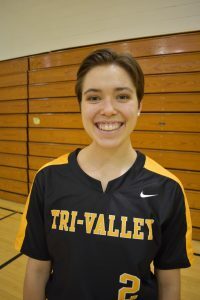 Tri-Valley junior moundster Vanessa Ashcraft earned the victory in the circle for the Lady Dawgs, surrendering six runs on eight hits over five innings, striking out five and walking zero. TV senior Alex Lemley (pictured below) led the Lady Dawg 18 hit attack with three singles and a triple and had three rbi’s, while teammates Reagan Baughman, Worthington (who led the way with four rbi’s), Savannah Shumway, and Brynn Miller all had multiple hits for the winners as well. Coach Seward’s Lady Dawgs are back in action on Wednesday, April 10, hitting the road for a visit to New Concord, to battle the John Glenn Muskie softball squad for a conference battle. On Thursday, April 11, the team returns to the friendly confines of Kenny Wolford Park and Don Barcus Memorial Field to face the visiting Crooksville Ceramics. Good luck to the Lady Dawgs!